During the process of working through the issues and question related to the PRACTICUM series I'm going through with Selenium 2 Testing Tools, I found that a refresher on my Java would be a good place to spend some time. There are a lot of resources out there for those who want to learn about Java, and for some of us, there are different things that resonate. Personally, I like hearing a human voice, one that can coach you through areas that might not make obvious sense when you are working with them. Many podcasts start from the premise that you are already experienced, and that you are looking to hear special topics or more of a conversational podcast about the state of your chosen language. As an example, I enjoy listening to Ruby Rogues for this very reason. For a choice to listen to and contemplate topics related to working with Java, I found "How to Program with Java" in iTunes. 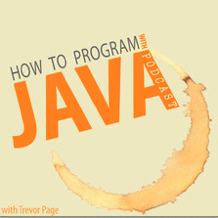 This podcast started in September of 2012, and roughly each week, Trevor Page puts together a podcast talking the details and the nuts and bolts about what Java is, what it does, and how to use it. The content is focused, it's easy to follow, and the coaching style helps a lot. Trevor takes the time to explain both simple things and those areas that are a little less simple to grasp. There is also a companion web site you can visit at howtoprogramwithjava.com that gives you access to other materials, as well as video tutorials and an E-book with exercises (those you pay for, but the podcast and other posts are free). For those of you out there who want to learn a new language, and if Java is something you might see being part of your future, or you need to come back to Java after a long time away, Trevor's podcast would be a worthwhile listen. This is Trevor Page and I just thought I'd say Hi, and thank you for the kind words. Thanks Jared. Actually, i do have an area with some questions I'd love to talk with you about. In my blog there's a section called "Practicum". In it, I'm dissecting the issues I'm seeing with "Selenium 2 Testing Tools" book by David Burns. I want to help David and Packt with the errata, but there are some issues that I am seeing that are beyond my present knowledge/understanding as to *why* they are not working. If you're interested, I'll email you and maybe we can see what's going on and help Packt update their examples.